Spring and early summer are the time of year that many homeschoolers wonder about what learning was accomplished during the year and if they should determine that by some sort of testing. Let me start off by saying that I am not an expert, but for various reasons, I do know a bit about testing and some of the options out there. You seem to be very knowledgeable in the home school area so I was wondering if you could help me. Next year my daughter decided that she would like to go back to school. She'll be a sophomore in high school. Due to various unfortunate circumstances I'm unable to get to my books and curriculum. I would like to test her to make sure that she hasn't forgotten anything and to pinpoint any weak areas. I was thinking about testing her with the current state standards and then taking it from there. Do you have any suggestions on how to go about this? Any feedback is appreciated! I thought there may be others in this situation, and wanted to share my answer here. If she's going back to a public or private school, chances are the school or school district will have their own methods of how to place her into classes. My first step would be to contact the district and find out how they would like to handle it, especially if you don't have your materials available to show them. I would also make up a transcript for her 9th grade year. They are going to want to see some sort of documentation of what she's done for her first year of high school. A local school district required this of a friend, even though her daughter was attending part time and only taking extras (e.g. art, photography, gym, ect) so she could play sports, which is allowed in my state. There is a possibility that they could not accept whatever credits she earned during her 9th grade homeschooling year and put her in 9th grade again at school. There is no guarantee that your credits will be transferable. You need to be able to present them with some sort of record for an easier transition. Now, if you are looking to see where she is at academically for your purposes, I would recommend one of the national standardized tests available, especially one which the school district will recognize. Depending on what sort of student she is, I have two suggestions. 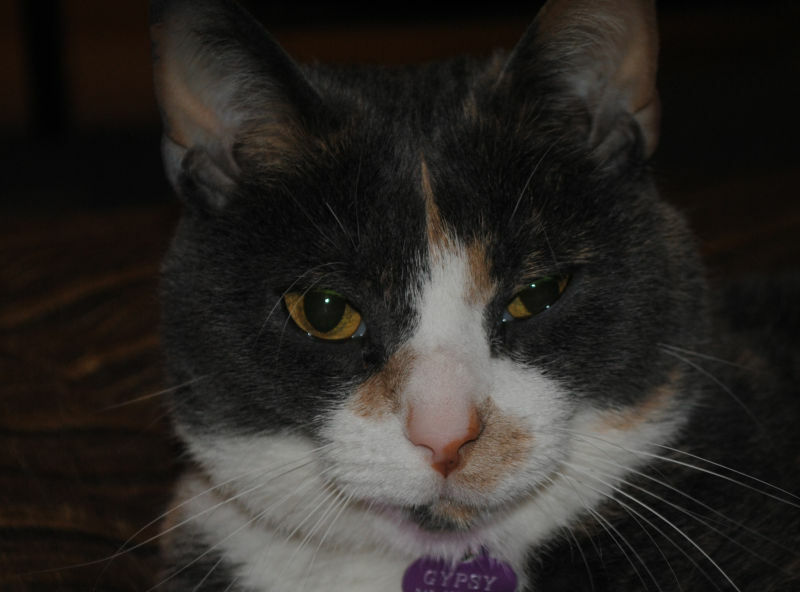 The first is the CAT (California Achievement Test) which is available inexpensively from Seten and others. The second, given she is high school age, would actually be the ACT, but only if she is an honors student and likely to do well because the ACT will remain on her permanent record with the College Board. The next available ACT exam is in October, since you can no longer register for the June exam. Or, for something less official, you could give her a practice ACT or SAT exam, available online and in study guides. The school district is not likely to accept the scores from a practice test though. Based on the info you've given me, I would recommend the CAT. Another option would be the IBTS (Iowa Basic Test of Skills), also available to homeschoolers. I did a series on testing last year. It isn't specifically for high school students, but you might find something helpful there. Again, you really need to call the school district and see what they require. They likely have their own placement tests. Again, I am no expert, but I'd be happy to answer any questions others may have or point you in a direction. Simply leave a comment with your question. After noticing our dogs were competing to get the better of the two dog beds, we decided to replace the old, smooshed-down bed that seemed to be the reject of the two. After we brought the new bed home, it became the new prize sleeping place. However, little did we know there would be a third competitor. 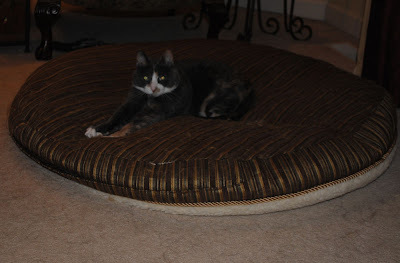 Since we brought the new bed home, our cat has decided it is her space. She has even gone so far as to boot one of our 115-pound dogs out of it on more than on occasion. "What a bully. I was comfortable too!" S-T-R-E-T-C-H "Thanks for the new bed! It's purrfect!" 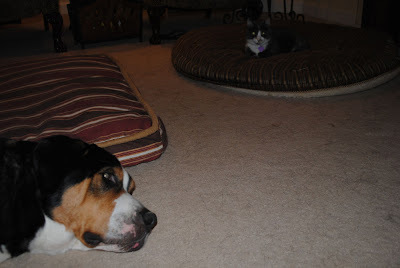 I have no idea what power this 8-pound cat has over our big lug of a dog. She doesn't scratch or hiss, but somehow manages to relocate her large furry friends by her simple presence. I guess it is all in the attitude. 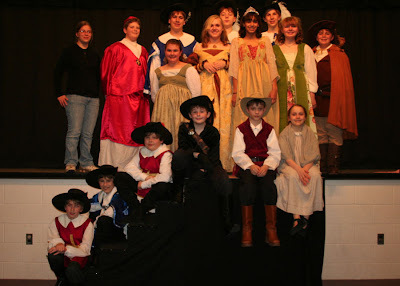 For the past five years, my kids have participated in a spring theater production with our homeschool group. Each year, as the kids grow and gain experience, we seem to top our previous year’s production. While it is a lot of work, with months of preparation, it is also very rewarding and fun. 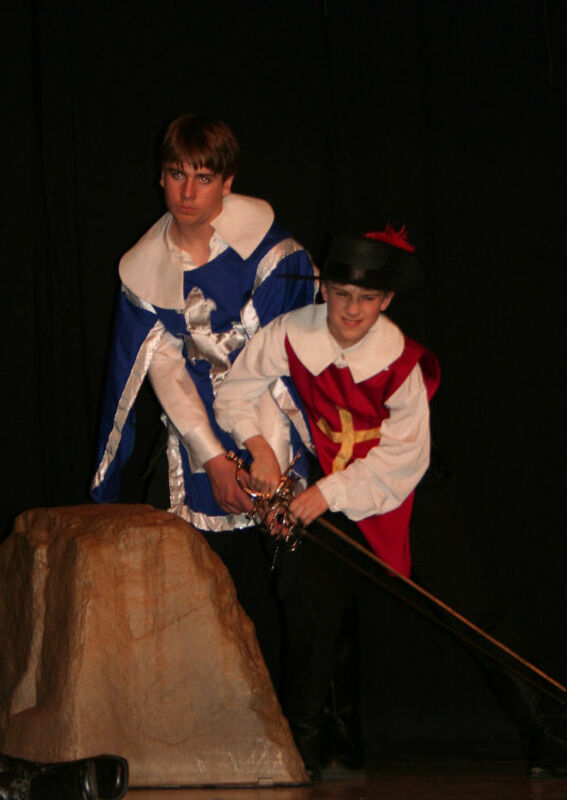 This year’s production was The Three Musketeers. 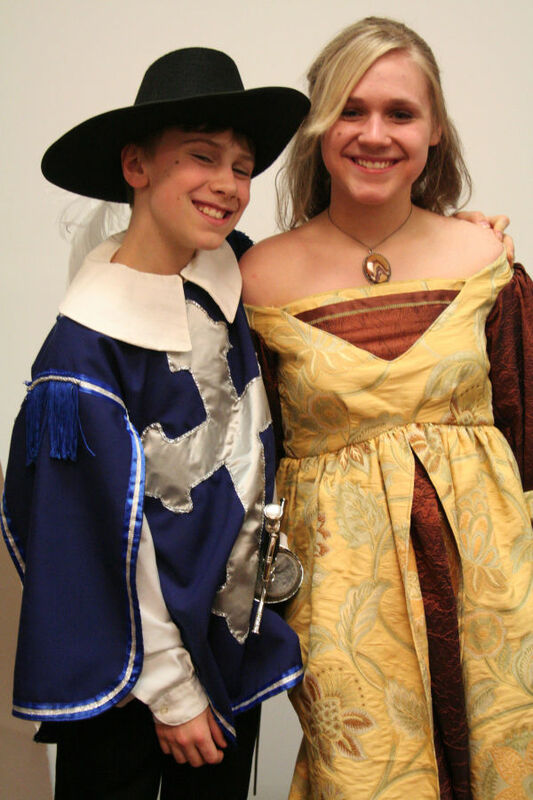 My daughter was the female lead, Constance. My son had two parts: Treville, the captain of the Musketeers, and Biscarat, one of the king’s guards. Finding costumes is always a challenge and a chore each year. This year we happened to have a talented seamstress in our group that offered to help, even though her kids weren’t even in the production. She found some great fabric deals for some of the costumes. Constance’s costume was super heavy! I had to do some trim and finishing work, so I wasn’t completely off the hook. 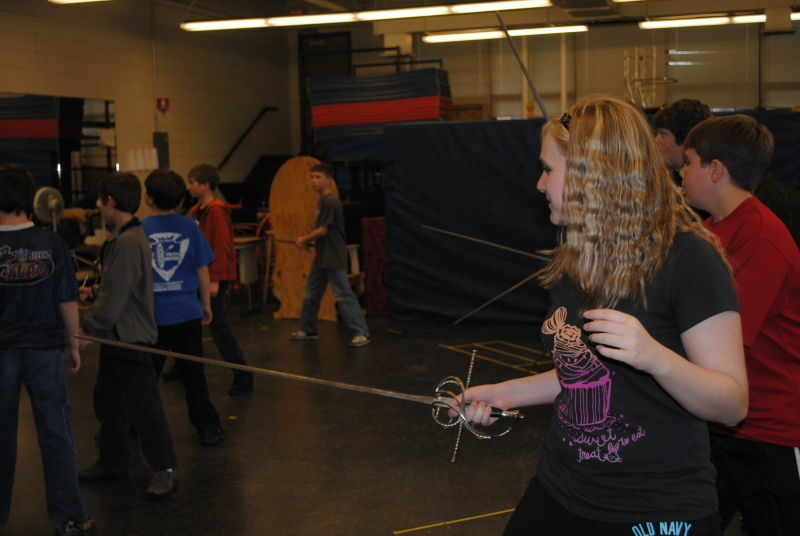 Because there were three sword fighting scenes in the production, the kids needed to learn a bit about stage combat. One of the parents found a local group that trains the professionals and agreed to give our group some lessons and help with the choreography. 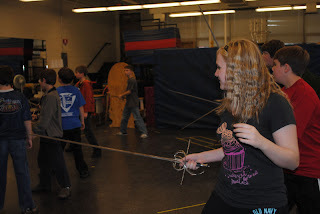 The group even rented swords (real metal, but not sharpened, obviously). 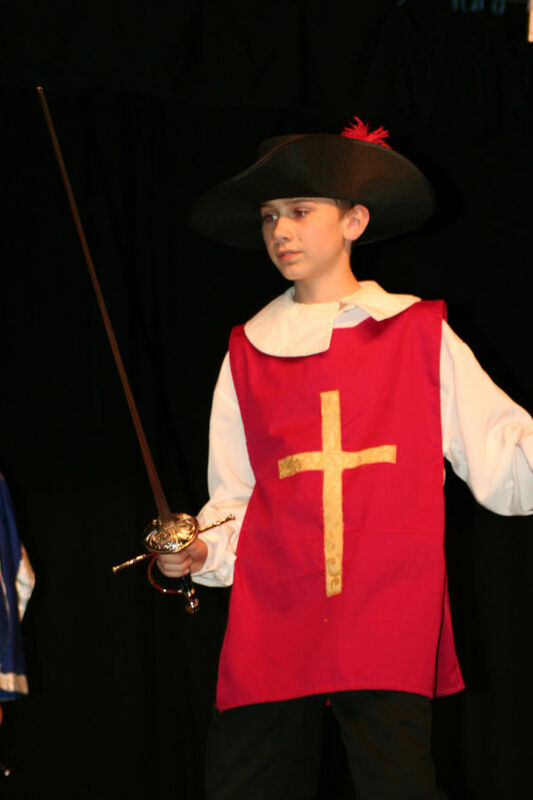 Constance didn't have a sword in the play, which disappointed my daughter! After a training session, the instructor let the kids try on some of the props at the facility. My daughter was a bit anxious about a stage kiss with the male lead, d’Artagnan. I think it was more the razzing of the other kids, rather than the actual kiss. No, they didn’t really kiss, but pretended to do so behind a hat. She really played it up and one night the audience whooped and hollered during this part. I absolutely loved watching my youngest this year. It is hard to believe he was a shy little thing when he was younger. I found it a bit humorous that the 80 pound Treville was captain of the Musketeers that were twice his size. All three boys that played the Musketeers towered over my son, which made for a humorous sight. My son worked hard on his lines and sword fighting scene, and did an excellent job. Guess who won the sword fight in this scene? Children’s theater is hard work (for both parents and kids! ), but very rewarding. The kids learn about more than technical acting skills, like voice projection, facial expressions, and voice inflection – they learn how to work like a team and see something through to the end. While, I'm still a bit fuzzy on exactly what his schedule will look like, below is a start. No promises it won't change before fall. IEW: I think we'll do SWI B, though SICC A is a possibility. I’m unsure on grammar – Michael Clay Thompson materials, Winston Grammar, Growing with Grammer, Grammar Ace, and Easy Grammar are all considerations right now. I'll likely add more on to this schedule, but not until I see how it plays out in the fall. My main focus is in the language arts area and improving writing skills. He's come a long way this year and it seems as though he'll turn another corner soon. Unlike my daughter's plan where much of it is a new resource and almost all is outsourced, I've slowly found what works for my son and am careful not to change much when I find a combination that works, the perfect alignment of curricula that makes everything happen. One thing I really need to add to our schedule is consistency, not just with curricula, but with our schedule. I can’t get sidetracked with the next shiny opportunity or program that comes my way. Unfortunately, consistency is extremely difficult for me. My son thrives on it, but my execution of it is shaky at best. I sure wish I could just open up my Rainbow Resource catalog and order a big dose of it for our homeschool. I think it would be my best homeschooling resource! For the past three years, we've had over-scheduled our fall, which included very time-consuming activities like First Lego League and theater productions. I promised myself that I would keep our fall 2011 extremely simple, because fall sets the tone for the rest of the year, and coming out of the gate with a zillion activities makes me feel perpetually behind long after the hectic season ends. I also think a more textbook-based schedule will help keep me on track. Some of it might be a little dry, but it helps my son to see progression (e.g. moving through the chapters) and gives me some structure, too. After two years of competing and one year of coaching, I opted to not have my kids participate in First Lego League. It is a great activity, but extremely time consuming. Instead, my son is going to try out a local jump rope team. This will be the one completely new thing on his schedule. The jump rope team requires less of a time commitment than some of our previous fall activities and will count as Phys Ed as well. I'll admit to having a side agenda. I'm hoping that all that repetitive jumping and exercise will also help my son keep his rear end planted in his seat long enough to complete his academic work. I just realized that my post for my daughter's plan was all about change and my son’s plan is all about consistency. The beauty of homeschooling is that I can do both for my kids. 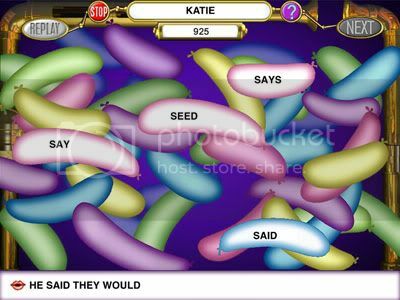 Wordy Qwerty, a software program by Talking Fingers, teaches children spelling rules through a series of engaging lessons and activities. The intended age range is 7-9 (2nd-3rd grade). It is available as an online option, or a CD-Rom. I first heard of Wordy Qwerty a few years back in Sally Shawitz's Overcoming Dyslexia, where it was recommended as a solid spelling instruction tool. Some time later, a friend shared with me how much it helped her dyslexic daughter. By that time, my son had already started steadily improving his spelling, and I wasn't looking to add another program to the pile of remediation resources we were already using. However, when I recently had the opportunity to review Wordy Qwerty, I was curious to see what all the fuss is about, even though my son is well beyond the recommended age range. If nothing else, it would reinforce already learned spelling rules for him, and I could gain some experience with the program to share with others that come to me for advice on helping their kids with spelling. I quickly found out why it is often a recommended spelling instruction resource. The program has 20 lessons in all, each covering a different rule, listed below. With a two talking keyboards (one a computer keyboard, the other a piano keyboard) gently encouraging the child to earn spheres and points to help make a Marveleous Music Machine, the student is taught to recognize patterns in each lesson and then is provided with the rule. A catchy song for each rule is included to help aid in retention. Each lesson has six activities and games for the student to complete: Patterns Game, Karaoke, Recycler, Pop-a-Word, Write Stories, and Read Stories. The games are engaging and give the student more practice with the rule. Full game descriptions are available at the website. Patterns Game. 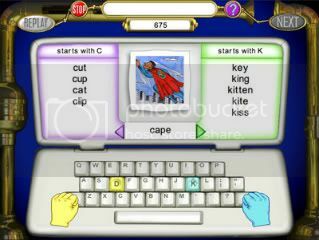 If a student gets stuck on spelling a word, the hands on the screen will show them what letter is next. It sounds pretty simple, but this is a solid program. I can see why I heard it recommended on more than one occasion. The instruction is not limited to just spelling a handful of words and rule memorization. The activities, which also require tasks and skills such as memory and visual tracking, increase fluency and comprehension in reading and writing. The Pop-A-Word game increases reading fluency by requiring the student to quickly select the right word in sequence before it disappears. My son is nearly 12, well beyond the recommended age. However, he is a struggling speller that needs clear instruction and well-explained rules to follow. Surprisingly, Wordy Qwerty was one of the first things he asked to do each day. While he felt the presentation a bit young for him (I noticed a few eyerolls during when he had the option to record himself singing during the Karaoke game and talking keyboards really aren't his thing), he said not only was it a great review of the spelling rules, but that he learned some things, too. I never timed it, but each lesson probably took him 15-20 minutes. He completed the entire program in a little over a month. As a parent, I was able to set controls on his account. For each lesson, I could set a Pass Level percentage. If this percentage was met, the program would move him on to the next lesson. If a student does not reach the Pass Level, the program has them repeat the lesson. It should be noted that they are only sent back once, and will be moved forward even if they don't pass the second time. This is done so as to not discourage the child. Parents are able to keep tabs on the final percentages for each lesson so they know which rules need more work, possibly having the child go through a particular lesson again. Parents can also set days and times when the student is allowed to log in to the program. I liked the report available to parents that showed the lessons completed and the scores earned. I did find that sometimes the program was slow to load when moving from one activity to the next, but my son never mentioned it nor complained. I also felt the parent area could have better navigation tools, but with some trial-and-error clicking, I was able to find the settings or reports I was seeking. I highly recommend that you have your child try the sample lesson (Silent E) available on the website. Your student will be able to experience a full lesson and each accompanying activity. It is an excellent try-before-you-buy opportunity. Wordy Qwerty is an excellent resource for solid teaching of the spelling rules for beginning spellers, as well as a remediation tool for older students. A online license is available as a 1-year license for 1 user at $25, up to 5 users for $71.25. A CD-Rom version, complete with an audio CD of the spelling rule songs, is available for $35. Visit the Talking Fingers website to learn more or to purchase. Curious about what other TOS Crew members had to say about this product? Visit the official TOS Crew blog to read more reviews. You can also find previous TOS Crew reviews on other Talking Finger products here. I hate being unsettled about plans for school. I thought this year would be different, as I had a pretty solid plan for 2011-2012 for my oldest as early as January. However, as new opportunities and resources came my way, the "final" schedule started constantly evolving. It wasn't a matter of one opportunity or course changing another. 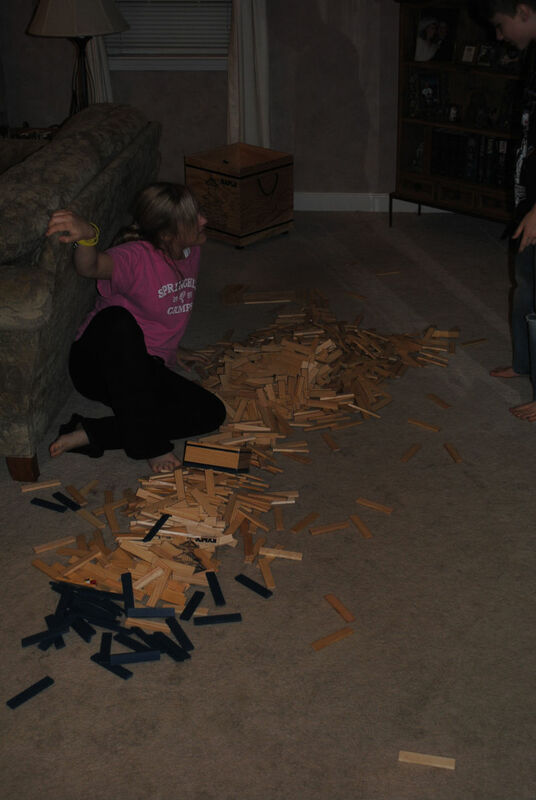 It was more like one change having a domino effect, requiring several adjustments. The only possible adjustment is our science option. I've been toying with switching to Adv Biology, which my daughter says she prefers. The class, however, is a bit of an unknown since the provider does not have an instructor nor text assigned to that course yet. There are other factors involved, too, so I'm leaving it as is for now. While heavy with online options, two of the online classes have a lot of student interaction. One has none and the other I simply don't know yet. There are several local students taking the AP online class, so I sense an in-person study group being formed. Between the potential study group, the university classes, and extracurricular activities, I think my extroverted teen will have plenty of people exposure to keep her happy. When I look at this schedule, I realized that with the exception of Latin and karate, all of these resources are new to us this year. After sticking with the same resources for the past couple of years, this year will certainly bring about some changes. Changes are inevitable now that we are officially heading into high school. After 9 years of homeschooling, it is a bit scary to be heading into official everything-I-do-could-impact-the-rest-of-my-kid's-life territory. Ok, that isn't exactly true, but it sure feels like it sometimes. It is also sad to realize that college is just around the corner. Changes indeed. I'll save you my David Bowie impression here...it isn't pretty. Now to finalize my 7th grader's plan. It was so much easier when our day consisted of curling up with a great read-aloud, practicing colors and letters, and heading out to Park Day. Wooden building blocks...not just for littles! Several years ago I splurged on some wooden Kapla blocks. 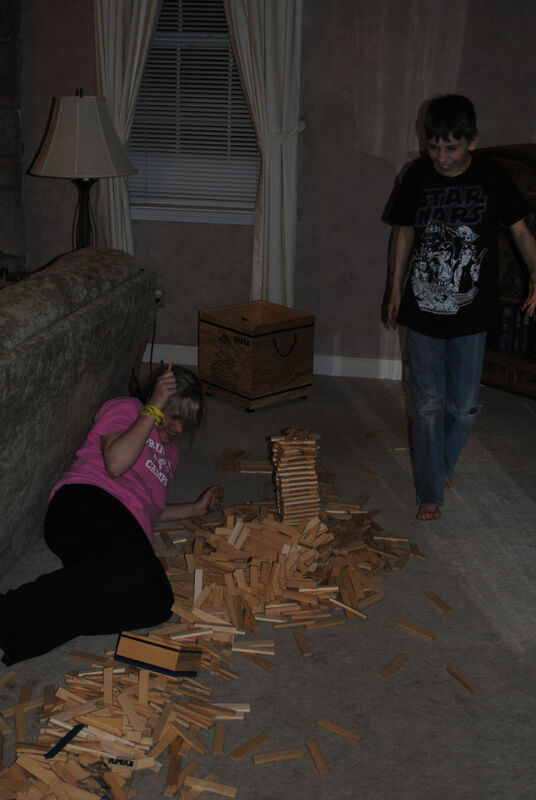 It felt a little strange to be purchasing wooden blocks, seeing that my youngest was about 9 at the time. Pretty cool, eh? 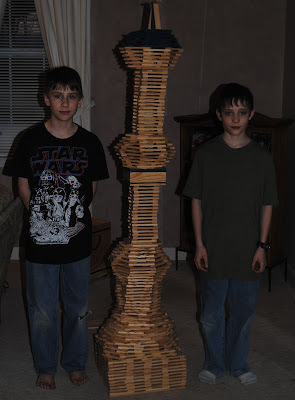 My son (on the left) stands about 4'-10", just so you get an idea of how tall this tower is. I think they used all 1000+ pieces we own. After his friend left, my kids decided to make a giant Jenga game out of the tower. 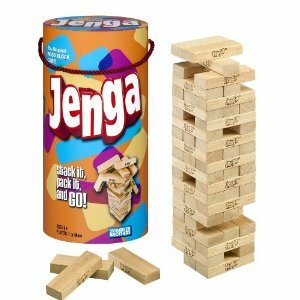 If you aren't familiar with Jenga, a (much smaller) tower is built of wooden pieces and opponents slowly remove a piece while trying to keep the structure from falling. 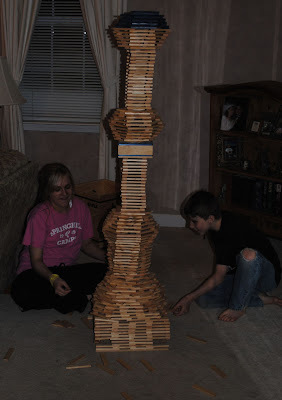 Whomever collapses the tower loses the game. They found they had to remove quite a few to even get the structure to budge. 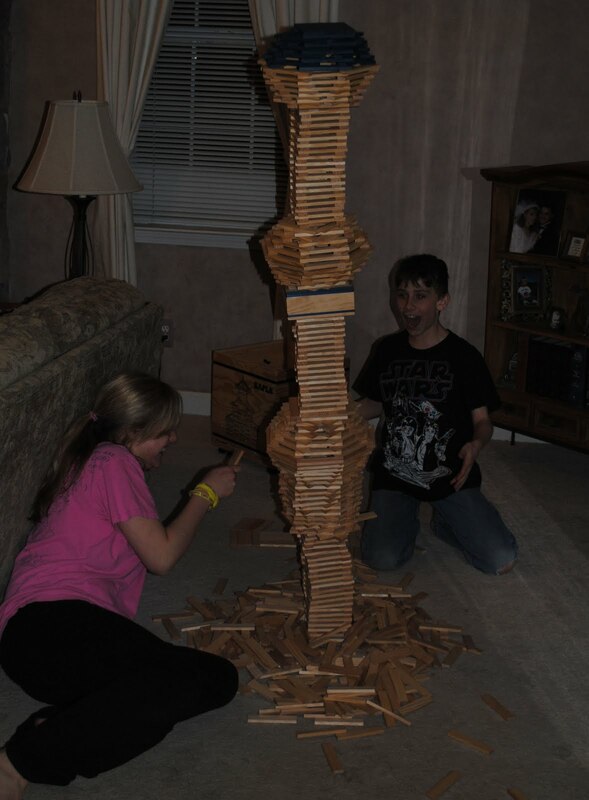 Soon the bottom collapsed, but the structure was still standing. Down comes the rest! Unfortunately my camera didn't capture much of the exciting fall. Though you can see the delight it created! Great fun for a tween and teen, no? It sure beats video games! Unfortunately, they no longer sell this particular brand in the U.S. I have since seen other brands that are very similar. 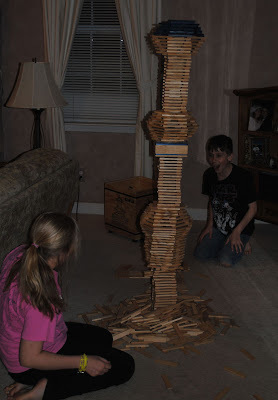 I have a feeling my kids will be coming home from college and will still build with these blocks! Have you ever been on the hunt for just the right map, found something close, but it had too much or too little information on it for your purposes? Wouldn’t it be nice to have a program where you could change and customize maps to suit your needs for individual studies and projects and spend more time teaching with the maps rather than hunting them down? Bright Ideas Press’ new WonderMaps program has over 350 customizable maps for your history studies. 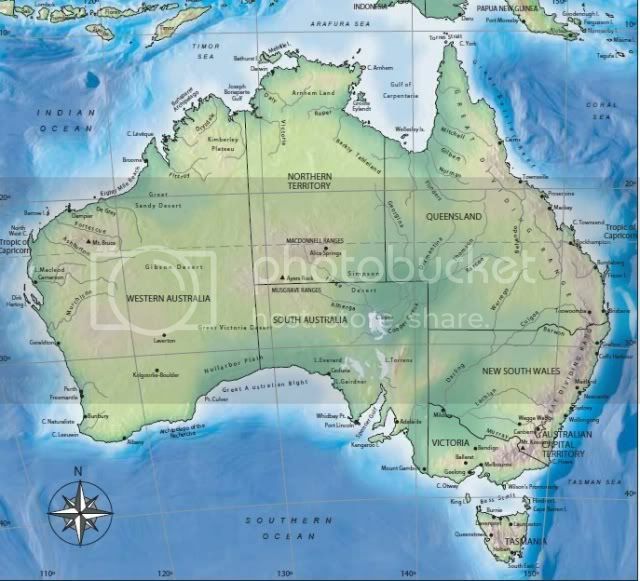 This very user-friendly software program provides maps in four categories: The World Continents, The United States of America, Historical Maps and Thematic Maps. What is unique about the program is the layering feature, which reminds me of Photoshop, for each map. For example, if we were studying our state of Michigan in our homeschool, I would have a variety of options for a map that fit our studies. Going in to the WonderMaps program, I would first click on The United States of America, then select Michigan from the map. What comes up is a Michigan map labeled with the major cities. The surrounding states also appear and are labeled with the state name. From here, I would have several options to modify the map. I can add or remove the state name, capital name, city names, city locations, rivers and streams, and/or political colors. If I wanted just a black and white outline map, I would turn off all the above options. Let’s say I wanted to quiz my kids on the locations of the major cities. In that case, I would turn off the city names, leave the location (the dot for each city), and print off the map. Each map can be altered in a variety of ways based on what options you select. In the pictures below, you can see the variation of the same map that can be achieved with a few clicks. Aside from the option to customize the maps, the ease of navigation is probably one of the main advantages to the program. There is no scrolling or flipping through pages, rather the user finds the region or era and narrows down the choices with a series of clicks. To see exactly how the program works and additional features, the tutorial below is extremely helpful. As someone who has used All American History and who also has The Mystery of History on my shelves, the maps from those texts were a nice bonus. I do want to point out, however, that those particular maps are not layered or customizable and are just duplicates from the text. The maps from the All American History Student Activity Book, which are usually the maps from the book minus markings (e.g. an exploration route) are not included. Some of the categories are more limited than others. For example, a map for Africa is available, but individual maps of the countries are not. One may get around this by enlarging the Africa map and adjusting the screen view to show just the country wanted, then selecting “current view” in the print options. A few maps aren’t as clearly defined as I would like, in that they include bordering countries that aren’t part of the territory, but there is nothing distinguishing it from the featured area. 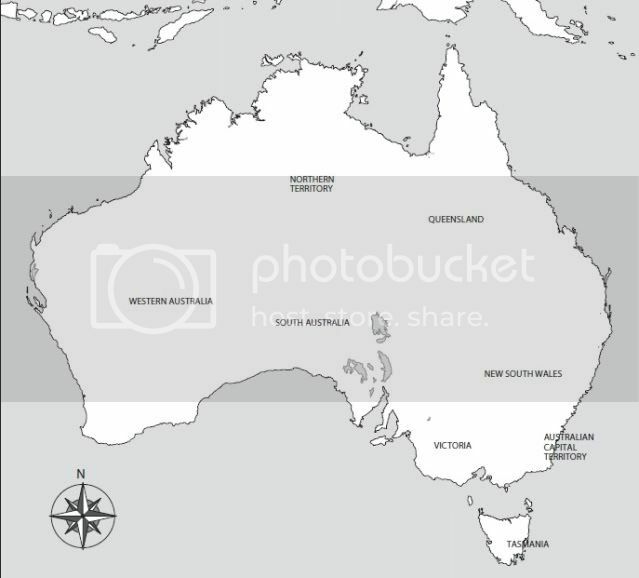 For example, Mongolia is included in the Oceania map, but there isn’t anything on the map (e.g. colored sections) that show Mongolia (part of Asia) is not part of Oceania. Depending on what is being studied, this may or may not matter. I use it only as an example that any program has limitations and that the maps aren’t completely customizable, even in ways that may seem simple. WonderMaps is very visually appealing and easy to use program for map studies. In addition to the customizable features, I like how the maps are categorized, making the sought after map very simple to find. The ability to enlarge and print sections is also very appealing. While there is room for improvement, there is a lot to like about this program. 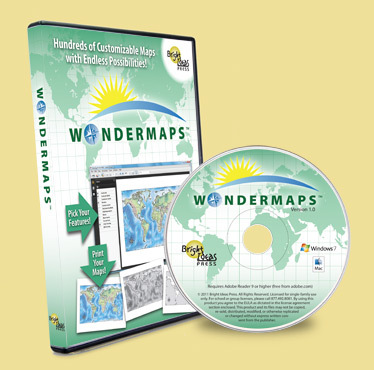 This version of WonderMaps is a first release with an update expected to be released late summer of 2011. WonderMaps is available at the Bright Ideas Press website as download and CD versions for $49.95. Curious about what other TOS Crew members had to say about this product? Visit the official TOS Crew blog to read more reviews. If you’ve been around for any time as a homeschooler, you are probably have at least heard of products by Institute for Excellence in Writing (IEW). You may or may not be familiar with the method. If you are like me, you may have thought it wasn’t for you based on what you thought you knew. Writing? You actually need to teach writing? I was spoiled with my oldest when it came to teaching writing. When she first began stringing to words together on paper, I simply told her that writing is a lot like talking. And she talked a lot! (smiles!). It was a pretty easy transition for her to get words on paper. She was a natural writer and just needed some guidance. Easy peasy. Then enters a boy who would rather build forts all day. I had no clue how good I had it until my son picked up a pencil...and then threw it across the room (yes, really...) Writing was painful, both physically and mentally. Nothing provoked tears more than the thought of putting pencil to paper. His mind would go blank and he simply didn’t know where to start. I had tried some of the gentle approaches I used with my daughter, but he wasn’t progressing much. It was simply too much to form letters, try to remember spelling, and recall punctuation and grammar rules all at the same time as composing. Desperate situations call for trying new things. Then a couple of years ago Andrew Pudewa came to our area to offer several writing workshops. They were inexpensive and convenient, perfect for satisfying my curiosity. I decided to put my son in one just to see, even though I thought I knew what IEW was all about and had determined it really wasn’t my style. However, I was willing to try most anything at that point. Much to my amazement, my 10-year-old son sat through class, stayed engaged, and actually wrote with zero tears. I about fell off my chair as I watched from the back of the room. Previous accounts from others about IEW being too confusing or too formulaic were quickly trumped by the fact my pencil phobic son was writing without tears staining the paper. It didn’t take a long time for me to become an IEW fan. The approach that would have likely stifled my oldest natural writer was an absolute necessity for my youngest. IEW is one of those few products that I was quick to dismiss early on in my homeschooling years only to gush about later. So, what is so special about IEW? What magic does it work for writers? Though my son has been using the Student Writing Intensive Level A, I was able to explore that magic with the next level up when I received the Student Writing Intensive Level B (SWI B) for review. Also included in my review package were the Structure and Style Overview DVD and a Portable Wall. SWI B, targeting grades 6-8, includes a set of 4 DVDs, a student binder, and a packet with teacher’s notes, handouts, and checklists. The DVDs contain recordings from a previous 4-day workshop taught by Andrew Pudewa. The student binder contains daily lesson suggestions and disc handouts. Depending on the pace, there is enough material to provide 15-30 weeks of instruction. I wasn’t sure how my son would do with the instructional DVDs, since they are recordings of Mr. Pudewa teaching a classroom of kids. However, no crazy graphics or shifting from screen to screen are a bonus from my perspective. I was pleasantly surprised to find my son answering the questions and following along just fine. You can see a video excerpt from Level B below. Mr. Pudewa is very engaging and has an excellent balance of providing instruction, encouraging students, and inserting just the right amount of humor to keep them engaged. Students don’t watch a DVD segment each day, rather they will watch a portion, then complete several assignments before continuing on to another DVD segment. A suggested schedule is included in the packet. I’ll admit, when I first looked through the printed IEW materials for the very first time, it seemed rather unimpressive. However, once I started digging in to the program, that initial unimpressed attitude quickly faded. When I received the Level B, I was very pleased to see that the packet of supporting materials had been updated to a much easier format than the previous version. The current version has been expanded, includes much clearer lesson plans, and has better organization of handouts. I was so pleased with the improvements, that I may purchase an upgrade for my older version. You can see a sample of Level B teacher’s instructions and lesson schedule (note: this is an e-book sample, but you will receive a hard copy with your SWI). Below you will find a comparative chart of the topics covered in the various levels of the SWI. Sounds good, but show me the writing! One of the main focuses of IEW is to take away the overload of figuring out what to write in order to spend mental energy on how to write. In fact, in the very beginning, kids don’t write at all. Instead, they learn to outline, starting with three key words per sentence. This did two important things for my son. 1) It completely took away the whole writer’s block issue, and 2) picking three words from a sentence isn’t so intimidating. Students also narrate the passage back using the outline only. This step helped my son quickly figure out if he selected words that effectively helped him remember what the content of the passage. Once the outlining is mastered, students move on to actually writing using the outline. There are a few rules along the way. Students must double-space and are not allowed to erase. Mistakes are simply crossed out with a single line. Then, as lessons progress, more requirements are added. “Dress-ups” and “banned word” lists are added throughout the program. Students are given a Composition Checklist to make sure they are following the specifics of what is required for each lesson. I never learned that term in my composition class! What are “dress-ups” you ask? When I first heard IEW users talking about “dress-ups”, I asked the same. Dress-ups in the IEW program are requirements for each assignment thatprovide ways to improve writing by forcing certain elements into the student’s composition. For example, by Lesson 5 in SWI B, students are required to include a “-ly” adverb, a who/which clause, a strong verb, and a because clause in the assignment. To make sure this is done, there is a box to check on the Composition List and they must underline it in the assignment. There is plenty of support for the pencil phobic. Now, if your pencil-phobic kid is anything like my kid, asking him to remember to use an “-ly” word while composing, let alone even thinking of an “-ly” word to use, may just put him over the edge. Andrew Pudewa definitely foresaw this issue and includes lists of “-ly” words as suggestions,among other supporting lists. These lists are included in the packet, but I found the Portable Wall included in my review package very handy for reference. At first, my son would always need to go back and add in his dress-ups after getting his initial thoughts down, which is absolutely fine. It forced a safe and non-frustrating way to self-edit very specific items. Sometimes his edits to include a dress-up sounded a bit awkward because he had forced a word somewhere that didn’t quite flow in order to meet the requirement, but several things happened over the course of using this process. 1) He became more open to editing his work. 2) He was more willing to try new words and expand vocabulary, rather than stay with safe words he already knew and could spell. 3) He recognized that the writing did often sound better with the dress-ups added. 4) He started becoming more aware of what dress-ups were required for the assignment while composing, naturally improving his writing ability. 5) I noticed he started using some of these tools writing for fun (yes…he’s started writing for fun!). For example, “said” is a banned word in the program, and I’ve noticed words like “exclaimed” or “shouted” being used much more often when writing casually. My son is very much a "just tell me what to do and I'll do it". He needs a rule-set to follow for writing, and IEW successfully provides that for him. It is no longer a mysterious and frustrating process. IEW is seriously good stuff! I can’t even begin to tell you how sold I am on IEW products, especially for reluctant writers. I am feeling much more confident in teaching my son to write and no longer see him doomed to flipping burgers because he can’t write a decent paragraph. He has made a ton of progress using this program, not to mention the tears no longer roll. My only regret is that I didn’t find the program sooner. My son needed the very structure that originally turned me off to the program. Furthermore, I can see how natural writers could improve their writing, if they are open to very structure instruction. I’ve since gone on to purchase other IEW products and I’ve been pleased with them all. IEW, SWI, TWSS, SICC, ABC...so many letters. What do I need to start? You may have noticed all the letter abbreviations people use for IEW products and have been equally confused as I was initially. The SWI (Student Writing Intensive) Level A, B, and C all have a similar method and assume that student has had no previous experience with the program. The main difference in the higher levels are more dress-ups and items on the composition list are introduced at a faster rate and the source texts use vocabulary and are at a length for the target age range. If you aren't sure where your student should start in the program, the IEW website can help direct you or customer service can assist you. The Structure and Style Overview is a 2 hour 20 minute overview of the IEW method and briefly covers the 9 units of structure of the program. While the full teacher/parent Structure and Style (TWSS) course (which I previously owned) is recommended for an in-depth view of the method, the Overview DVD in combination with joining your student in watching the DVD lessons will give you the tools you need to successfully teach the materials. My boy still would rather make forts all day, but I'm so thankful that Mr. Pudewa has taken into account that many little boys are fort-builders and not designed to be the elementary writing teacher's dream student (see Mr. Pudewa's DVD seminar on this very topic). It has saved our family a whole lot of frustration in the writing instruction department. Rather than continued exposure to my gushing, I suggest you head over to the IEW website to see if this program or other IEW products may be a fit for your homeschool. The SWI Level B sells for $99, the Portable Wall for $7 and the Structure and Style Overview DVD for $10. All of the products come with a complete satisfaction guarantee. The website also has a ton of Help and Support for learning more about the products and what ones will suit your needs. And by the way, forts make a great space for some tear-free writing! Spelling Power, Story of the World, Quarter Mile Math, Math U See, and a ton more. Who doesn’t love curling up under the blanket or sitting outside on a sunny day with a good book? Feeling the weight of the text in your hands, flipping page after page, and becoming lost in a good story... ahhhhh. When e-readers first started to hit the market, I was sort of indifferent. Reading from a screen just isn’t the same. I want a books to place upon my shelves, loan to friends, or even dog ear the pages. Going digital just seemed wrong. Besides, I’m extremely frugal and usually purchase real books at library sales for 50 cents. Why would I pay $5-10 for a digital copy instead of the real thing? However, as the popularity of e-readers grew, I started to reconsider. I discovered there are many low-cost or even free quality books available. Some readers have capability of using library services for e-books and several allow you to loan titles to friends. The price started dropping to the point that it was actually cheaper to buy a Kindle than it would be to buy the number of bookshelves I needed to support my growing book collection. This February, I finally caved and purchased my Kindle. Now I’m wondering why I waited? I also found that I had two kids eyeballing my new toy. So, not only have I been on a quest for quality and inexpensive adult e-books, but quality children’s and young adult literature as well. When I discovered that I would have the opportunity to review an e-book bundle from Yesterday’s Classics, I did a little happy bibliophile dance. Yesterday’s Classics republishes titles of the golden age of children's literature, from the time period of 1880 and 1920. Having been out of print for many years, these aren’t titles that you’ll find at the library used book sales. In addition, the rich vocabulary and stories of classical literature typically is not found in modern titles. The titles cover 22 different genres for ages 5-14, classified as Level 0 – 3. Over 180 of the titles are for ages 6-11 (Level 1 and 2). There are roughly 15 in Level 0 and 25 in Level 3. The lower levels are categorized by interest level, rather than reading level. I will note that the older children will likely be interested in the lower levels. These are not twaddle books! 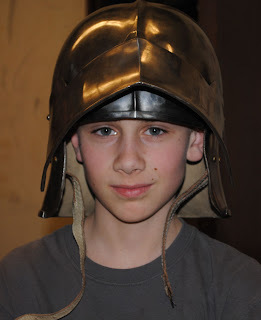 My almost 12-year-old had no problem becoming engaged in the Level 2 book The Story of the Romans by H.A. Guerber and I actually enjoyed reading Grammar-Land (also Level 2) by M.L. Nesbitt. I was thrilled to find some supporting materials for Grammar-Land and hope to incorporate this narrative grammar instruction into our homeschool. While many of these titles are available for free on the internet, Yesterday’s Classics is providing more than mere text. For starters, the each Yesterday’s Classics title includes a Table of Contents for easy navigation, illustrations (even in color if the original text is color), and readable formatting. Email support is also available if trouble downloading occurs. In addition, many of the titles are used in various homeschool programs, listed below. Click the program you are interested to see what titles are included. Purchasing the package makes all of the 225 titles accessible with just a few keystrokes. While you could spend hours searching out the titles and downloading them individually, you won’t necessarily find the same readable formatting even if you could find them all. The package of 225 titles is available for $99.95 through May 31st. At first, my frugal mind thought this was a bit pricey, until I pulled out the calculator. At less than 45 cents a title, each title cost less than my used book sale finds at the library. Furthermore, no extra shelves are needed! The same Kindle and EPUB titles are available individually from Yesterday's Classics for $2-6, making the package just a very small fraction of purchasing the titles individually. If you have more than one kind of e-reader, Yesterday’s Classics will provide both the Kindle and EPUB versions for one package price. Seeing that my daughter is considering a Nook and I have a Kindle, this was a nice bonus. If you don’t have a reader, you can download e-reader software for free and read the titles on the computer. Titles can be printed or even read on mobile devices (Note: The Kindle App for ipads and smart phones currently does not support the titles in this package.). I have selected titles handy on my Kindle and the rest stored on my computer for future transfer to my Kindle, rather than stuck under a bed (because of space issues) out of sight of eager readers. Since I’ve gotten into the habit of carrying around my Kindle with me when running errands and going to appointments, it is nice to have some quality children’s literature available for my kids when we have an unexpected delay. My son enjoyed 14 chapters of one title while waiting for his sister during an appointment, rather than occupying himself with a gaming system or otherwise being bored – definitely a situation makes me better appreciate the digital age of literature. The nicer formatting and convenience of the titles in one spot makes this e-Book package a useful and economical option, especially for a family with children of multiple ages to make use of all the titles. Furthermore, if you use a homeschool program that uses the titles provided, this package is a definite time and money saver. Want to sample a classic title from Yesterday’s Classics before purchasing? The Dutch Twins by Lucy Fitch is available as a free download in both Kindle and EPUB versions (links can be found here). The Yesterday’s Classics E-book Package can be purchased for $99.95 in both Kindle and EPUB versions for $99.95 with a 100% Risk-Free Guarantee.